The origin of Turkish theatre dates back thousands of years to ancient pagan rituals. The dances, music and songs performed during the rituals of the inhabitants of Anatolia millennia ago are the elements from which the first shows originated. These rituals later became theatrical shows. 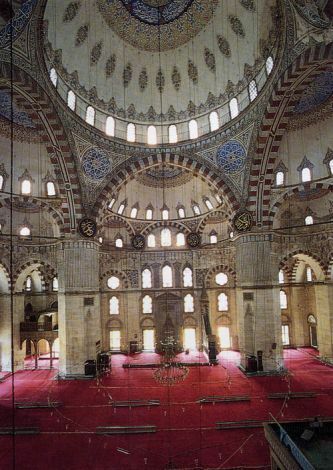 In the 10th century, a blend of traditions occurred between the Seljuk Turks and those of the inhabitants of Anatolia. The interaction between the various tribal societies paved the way for new plays. After the Tanzimat (Reformation) period, characters in Turkish theatre were modernized and plays were performed on European-style stages with the actors wearing European costumes. Following the declaration of the second Constitutional Monarchy in 1908, theatrical activities increased and social problems began to be reflected in the theatre as well as in historical plays. A theatrical conservatoire, Darülbedayi-i Osmani, was established in Istanbul in 1914. During the years of chaos and war, the Darülbedayi-i Osmani continued its activities and attracted the younger generation. Turkish playwrights emerged. Some wrote on romantic subjects, others were interested in social problems and still others dealt with nationalistic themes. There were even those who wrote musicals. In time, Turkish ladies began to appear on stage and this was indeed a revolution of the time, since female roles had only been played by actresses who were members of Turkey’s ethnic minorities.